These classic Italian cookies are a Christmas tradition in my family. The original recipe is flavored with anise, but vanilla extract can be substituted. 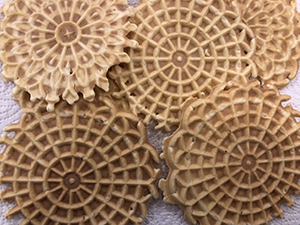 It’s necessary to have a pizzelle baker to create the authentic snowflake design; ours is made by Vitantonio, the company that also provided the basic recipe. 1. In large bowl with electric mixer at medium speed, beat eggs. Gradually add sugar; beat until smooth. Stir in margarine and anise or vanilla until blended. 3. Preheat pizzelle baker. Place dough at the center of bottom grid (1 heaping teaspoonful will make a full-size cookie). Bake about 30 seconds or until golden brown. 4. Remove cookies from baker with a fork and cool on racks.